By default, Guardian does not limit bandwidth use. However, it is possible to configure bandwidth limiting policies which can, for example, stop a user or group of users from overloading your Internet connection. Use the policy wizard to create bandwidth limiting policies — see Creating a Bandwidth Limiting Policy. It is possible to order bandwidth limiting policies. Ordering policies enables you, for example, to apply one policy to a user and another policy to the group the user belongs to. 1. Go to the Web proxy > Web proxy > Bandwidth limiting page. 2. Drag and drop the policy you want applied first to the top of the list and click Save. Guardian applies the order specified when applying the policies. 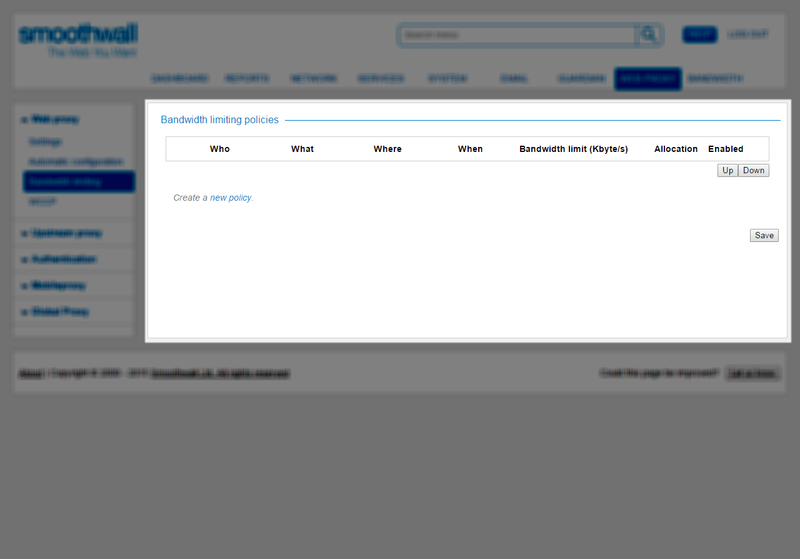 You can edit an existing bandwidth limiting policy to suit your organization’s requirements. 1. Go to the Web proxy > Web proxy > Bandwidth limiting page and locate the policy you want to edit. 2. Click the Edit policy button. Guardian displays the policy settings. 3. Make the changes necessary, see Limiting Bandwidth Use for more information about working with policies. 4. Click Confirm. Guardian displays the settings you have selected. Review them and click Save to save the changes to the policy. Guardian updates the policy and makes it available on the Web proxy > Web proxy > Bandwidth limiting page. You can delete a bandwidth limiting policy you no longer require. 1. Go to the Web proxy > Web proxy > Bandwidth limiting page and locate the policy you want to delete. 2. Click the Delete policy button. Guardian prompts you to confirm that you want to delete the policy. Click Delete. Guardian deletes the policy.